Help save the royal family! 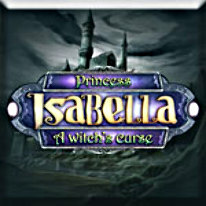 As Princess Isabella A Witch's Curse opens, Princess Isabella is all set to marry the love of her dreams, Prince Adam. After returning home from a trip, however, she finds that an evil curse has been placed on her castle by a mysterious witch. The curse has placed evil in every room, and turned everyone inside the castle into mirrors! Follow a fairy friend as you piece together the clues and save your friends and family in Princess Isabella A Witch's Curse, a gorgeous Hidden Object Adventure game!